General Motors Co. will move production of its revamped GMC Terrain to Mexico from Canada and expand production of the Ingersoll, Ont., plant’s Chevrolet Equinox, reflecting the growing popularity of compact sport utility vehicles. The automaker currently makes both vehicles at the Ingersoll plant. GM showed the new upscale Terrain for the first time Sunday night, on the eve of the North American International Auto Show in Detroit. GM has a lot riding on the Equinox and Terrain, which go on sale as redesigned models in the first quarter and this summer, respectively. Small SUVs are a booming segment of the market and a big moneymaker for the company, so when GM planned the new versions, it decided to increase output from one factory to three -- adding the vehicles at two existing facilities in Mexico, according to a GM spokesman. While the move is GM’s bet that more inventory will mean more new buyers, as well as a play to make more on each sale, it’s also partly a response to hyper competition among automakers seeking an edge through lower production costs. Even so, moving production of the new upscale Terrain to Mexico instead of the United States may risk testing the patience of President-elect Donald Trump, who has already has used Twitter to chastise GM and Toyota Motor Corp. for importing low-priced compact cars from south of the border. 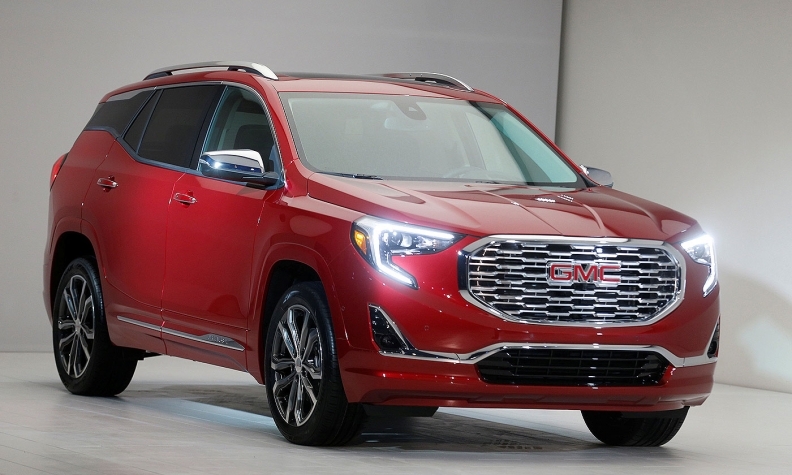 While the companies also sell these models in emerging markets, GMC is chiefly a U.S. brand with premium SUVs that have fatter sticker prices and higher profit margins than small cars. The 2015 labour agreement with the United Auto Workers union boosted wages and benefits for thousands of younger U.S. employees who previously made much less than veteran factory hands. Mexican autoworkers earn an average of US$8.24 an hour in pay and benefits, compared with US$46.35 an hour for those in the U.S. Canadian workers get similar compensation. Duncan Aldred, vice president of global GMC sales and marketing, said GM is using existing plants that can handle the production volume. He would not elaborate on Trump’s potential trade policies. “We have been planning this for a long time, and we’re using our existing footprint,” he said. GM sees growth for both vehicles. The automaker predicts the market for small SUVs will expand 10 per cent during the next five to six years. “It’s one of the fastest growing segments of the market, and we believe we can get a bigger share of it,” Aldred said in an interview. Terrain customers can choose from three different turbo-charged engines GM says can deliver strong acceleration with good fuel economy. The Terrain also has 4G wireless capability, a Wi-Fi hotspot and safety features including Forward Collision Alert that warns drivers of an impending crash, Lane Keep Assist with Lane Departure Warning and a Rear Cross Traffic Alert camera. Some of the added production in Mexico is earmarked for overseas. That’s partly because of Mexico’s 44 free-trade deals with other countries, which allow GM to export vehicles tariff-free to markets where it doesn’t have similar agreements, including Brazil, Colombia and the European Union. In late 2014, GM announced it would invest US$5 billion in new plants in Mexico by 2018, creating 5,600 jobs. The Equinox and Terrain facilities, which also make other models, are roughly US$1 billion of that. In 2015, GM said it is investing US$5.4 billion in plants in the U.S.
That same year, the UAW negotiated a four-year U.S. labour deal that gave veteran workers at GM, Ford Motor Co. and Fiat Chrysler Automobiles NV two three-per-cent raises and two cash payouts equal to four per cent of their pay. Entry-level, or so-called Tier 2, workers -- who once started at less than US$16 an hour and topped out at US$20 -- now start at US$17 and grow into the union’s traditional US$29. Those at Ford and GM also get the top-flight health insurance of their Tier 1 coworkers. Trump has complained about American companies shifting jobs to Mexico since the election campaign, when he criticized Ford for moving Focus compact-car production. While the Dearborn, Michigan-based automaker will go ahead with that change, it did announce it’s abandoning plans to invest US$1.6 billion there. FCA Chief Executive Officer Sergio Marchionne said this evening his company will invest US$1 billion in the United States to make three new Jeep models plus a Ram pickup it currently builds in Mexico. The plan includes retooling factories in Michigan and Ohio and adding 2,000 jobs by 2020, according to a company statement. The same day Ford made its announcement, Trump tweeted that GM should build its Chevy Cruze compact car in the U.S.
“General Motors is sending Mexican made model of Chevy Cruze to U.S. car dealers-tax free across border. Make in U.S.A.or pay big border tax,” he wrote. The Cruze was hardly the best example. GM makes only the hatchback in Mexico for sale in the U.S. and sold only 4,500 of them last year. Most of the almost 190,000 sedan models it sold in the U.S. were built at GM’s plant in Lordstown, Ohio. Chief Executive Officer Mary Barra, speaking to reporters at an event on Sunday evening, said that GM made its production decisions for all of its new models several years ago and has no plan to change them. The Equinox and Terrain could be a bigger deal. GM delivered 242,000 Equinox models to U.S. buyers in 2016 and 88,000 Terrains -- all from the Canada plant. Those SUVs aren’t cheap. The current Terrain starts at US$24,000, and GMC offers an upscale Denali edition that starts at US$34,000. GMC is a luxury brand, which CAR’s Dziczek said makes sense for production in Mexico.